I am not very good with goodbyes, nor am I very good with endings. 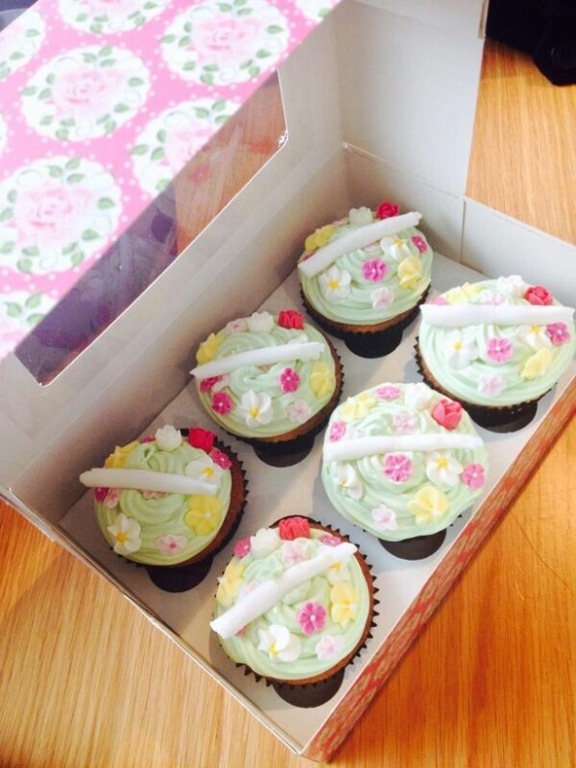 There are all those mixed emotions; denial, upset, happy tears, sad tears – it is all a bit much really. I think it is a mixture of all these that has caused me to pause rather often as I have been putting my thoughts together about The Days of Anna Madrigal, Armistead Maupin’s final in the Tales of the City series which I have loved since I was in my teens. Anna Madrigal is now 90-something and in the prime of old age, she has become something of a legend within the LGBT community, not only in her hometown of San Francisco where she is an institution, but all over the place. However Anna is filled with nostalgia and the events that happened when she was a young boy Andy, a boy who knew he was very different from the other boys and girls and who did something that Anna has been keeping secret for a very, very long time. I am of course very delicately tip toeing around any spoilers because I really don’t want to give anything away to have those of you who love the series and haven’t read this one yet, or those are just discovering it (and should really go back to the start as then you have nine books to get through) because you have such joys ahead – you lucky things. What I can say is that Anna decides that she will go back and face her past and rectify, if she can, any of the wrongs that she may have caused in her past. This gives the book a wonderful sense of resolution and (if you have read it) to the whole series going full circle. Anna Magrigal has always been the heart, and in many ways the link that binds, the Tales of the City series and indeed the wonderful characters, Mouse, Mary Ann Singleton, Mona, Brian etc, together throughout. Wherever she is they end up being (Burning Man is involved in this novel) or somehow finding themselves linked to her in another fateful or coincidental way. At the same time she has always really been its biggest mystery and enigma in the series. Where did she come from? What happened that made her lose contact with her mother and the whore house in Winnemucca? Well we go back to the 1930’s and find out thanks to some wonderful (and vividly described and created) flashbacks which brings the hardship of anyone ‘different’ to the full force and in a way looks back at LGBT history and, of course, supplies us with a great story. It is this mixture of a great stories with more serious issues lying in the background, sneaking into your brain, which is what I have always loved so much about Armistead Maupin’s writing. There’s levels and there’s bigger issues underlying to make you think, while the characters you love and the situations they find themselves in make it all the more real. The main theme for me in The Days of Anna Madrigal for me was ‘ageing’. Be you in your late twenties or thirties, your sixties or your nineties it is something we all think about, even if for the briefest of moments. Maupin looks at ageing and looks at its pitfalls, like your body failing you or not feeling able to keep up with the rest of the world or being at odds with it. I must point out it also celebrates it in many ways too. I often found it all incredibly touching. If only he knew, though Michael. Sixty-two was a lot like twelve and hormonal. Teenagers rage against the end of childhood, old people against the end of everything. Instability is a permanent condition that adapts with the times. The other themes of the book, which link to age in many ways, look at endings and goodbyes – I have already mentioned I am not very good at these. Goodbye’s don’t have to mean death, they can mean goodbye to friends you’ve moved on from, places you loved which maybe aren’t for you anymore, goodbye to guilt or the past. There is so much in any goodbye and again Maupin looks at this in a wonderful way which will move you, unless you happen to be dead inside in which case you don’t deserve the mixed tears of joy and sadness that might be ahead. It was the sense of pleasant nostalgia that I was left with the most having closed The Days of Anna Madrigal knowing it was the end of the series. A nostalgia for all the joy that the characters and their tales have brought me, along with the sense of having gone full circle. After all more often than not, the ending of something is actually the beginning of something else, or the start of a new cycle, isn’t it? I guess I just have to start all over again don’t I and relive the memories and stories that I am most grateful and thankful Armistead Maupin has brought into many of our lives. Actually, the end of the Tales of the City and Simon Savidge story, as I like to think of it, isn’t quite over yet. For one, I have just got my mother reading them and she loved the first. Secondly, I am giving it away on World Book Night, so I will be passing on the Tales that way too. So who else is a fan of the Tales of the City novels? Is anyone else gutted, even though we have all these to re-read, that the series has now come to an end? Oh and if you would like to hear Armistead talking more about the book, you can do so with me (who turned into a bit of a fan boy) here on You Wrote The Book. Are there any other series that are so endearing you could recommend to fill the void these will now leave? 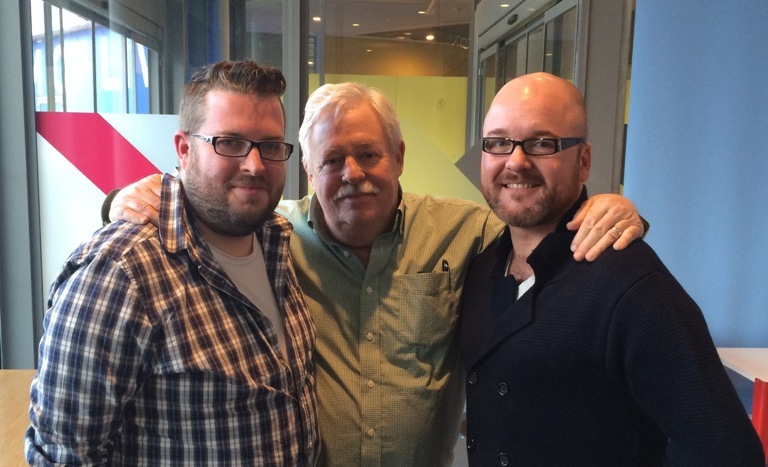 Tagged as Anna Madrigal, Armistead Maupin, Tales of the City, You Wrote The Book! More and more often I literally have to pinch myself at what a lucky young man (I nearly said boy but those days are long gone) I am, and all the joy that a love of books have brought me. Would the 15 year old me ever have thought that he would meet one of his literary idols sixteen years later? Never! 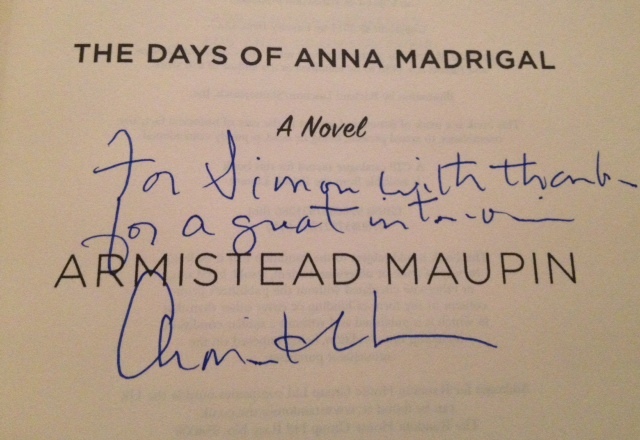 Yet that is what happened yesterday when I got to see, and indeed meet, one of my bookish hero’s Armistead Maupin who’s Tales of the City series have been a comfort, a friend and a place I can escape to for all those many years. Armistead was in Liverpool to do an event at the Museum of Liverpool in conjuncture with the wonderful Homotopia which celebrates queer arts and culture – I must talk to them about bookish stuff. Homotopia has an amazing exhibition on April Ashley at the moment. April was one of the first people who underwent gender reassignment, rather like the fictional Anna Madrigal, and so Armistead coming to celebrate The Days of Anna Madrigal seemed perfection – and it was. The audience loved him and he made us laugh, get a bit emotional and most of all think. And talk we did. I have to admit I went into utter fan boy momentum for a few minutes and then managed to regain some kind of cool. We chatted about Tales of the City, how much it means to people (how much it meant to me at 15 and now) and also some rather naughty bits and bobs. I won’t say anymore, you will have to wait for You Wrote the Book next week. I can say it was, after the nerves went, an utter joy. I wanted to pinch myself to check that it wasn’t some kind of crazy dream. However I have proof in the pictures and also in the, erm, proof. 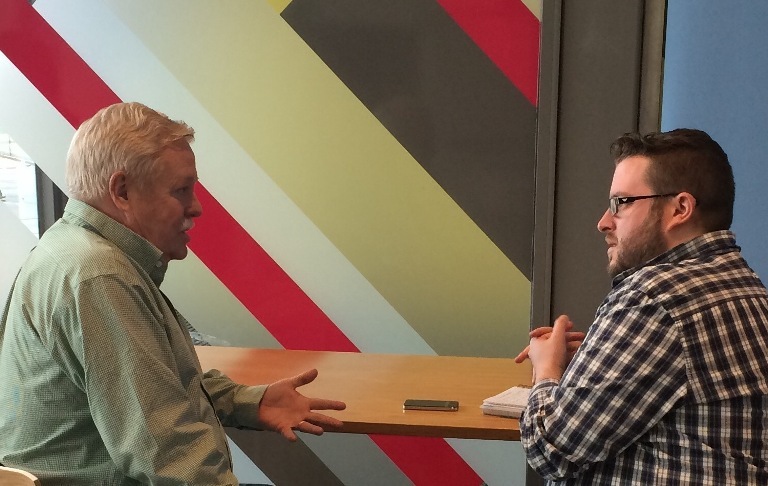 Yes that does say ‘a great interview’ – head explodes with joy! …The thing is, what would we be called? Anyway, I thought I would share one of the biggest bookish highlights I have had yet. See, books are brilliant, so are blogs. *Note not all authors I meet get specially made book themed cakes, though I have told The Beard that there could be a marvellous business in this! 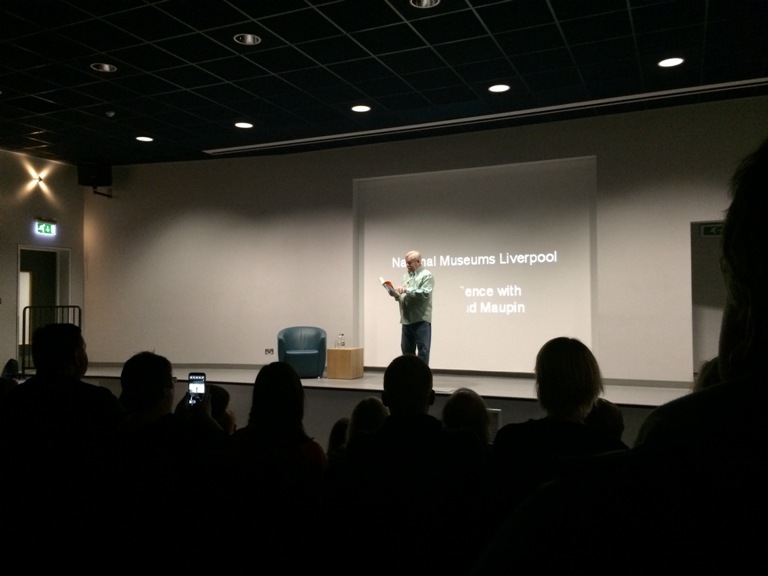 Tagged as Armistead Maupin, Homotopia, Liverpool, Museum of Liverpool, Random Savidgeness, You Wrote The Book! If you haven’t read any of the Tales of the City series then could you leave this post, turn your computer off and run to the nearest bookshop, buy it, curl up with it and then come back when you are sorry that you have missed such utter joys until this day. Seriously, jog on, I won’t speak to you until you have. 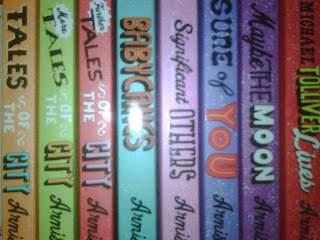 If you are one of those people who is clearly very naughty and is reading on, or if you have read them and you are wishing I would just get on with it, let me tell you that I think the Tales of the City books are not only my very favourite series but some of my very favourite books. Returning to them is always an absolute joy, I feel I have lived with these characters on 28 Barbary Lane for all my life – impossible I know but that is how much they have meant to me since way back when and how real they have become in my mind. Knowing that there was a new one coming out, The Days of Anna Madrigal, I decided to re-read them all again after the new year only I realised that I always seem to re-read the first three (Tales of the City, More Tales of the City, Further Tales of the City) and then stop so knowing them inside and out (in a gorgeous and familiar way) I decided to start with book four in the series Babycakes (possibly after watching the first three’s adaptations on DVD first, don’t judge me they are almost as good as the first), and once again was lost in that familiar world of Mouse, Mary Ann and Mrs Madrigal once again. Note: Now if you haven’t read this series and still haven’t gone, right this minute, to buy them all this is your last chance as being the fourth in the series I may have to give some things away. You’ve been warned. What I loved about Babycakes, and what I invariably love about every Tales of the City and Armistead Maupin book, is how on first glances these are a series of charming tales about a whole host of wonderful, diverse and colourful characters. Yet they also cleverly look at the much darker side of life and somehow make it more digestible without being any the less thought provoking or emotional. In Babycakes there are four main themes going on in the background; the first is subject of men who really want to be dads and stay at home husbands (which people still find an unusual set up), racism, grief and the arrival of HIV and Aids onto the gay scene in the early 1980’s. An expression of sympathy seemed somehow inappropriate, so Michael merely nodded. These moments in Babycakes really hit home, probably because of all the lighter and more quirky stories around them, which I think Maupin does brilliantly as they stand out all the darker. They are also done with great sensitivity and it is this duality, and was also done marvellously when dealing with the Jonestown Massacre in Further Tales of the City, which makes the series so important as well as being so compelling to read. I can’t really say any more than that, I just really love them. Since reading Babycakes, just before I started Significant Others, I discovered that The Days of Anna Madrigal will be the finale to the whole series. I won’t lie, having loved these books since I was a teenager (they were like a godsend to show there were more diverse/different people out there in the world) my stomach almost dropped out with horror. So I have decided that I will save the fifth to eighth book re-reads until after I have read the finale and have them to go back to afterwards. I have a feeling there will be tears for all sorts of reasons. I wonder if when I meet Armistead next week (for You Wrote The Book, if any of you have questions let me know) I could slip him a £5 note to get him to write just a few more? Ha! For a slightly less rambling and emotional response to Babycakes visit A Guy’s Moleskin Notebook. Who else has read the Tales of the City series, be they in your formative years or not, and which has been your favourite along the way? Can you believe that it is really coming to an end? If you haven’t read them yet, then what on earth are you still doing reading this post? Get on with your bothers and down to a bookshop/library right this minute! It is very rare that I re-read a book, even my favourites. I always have a fear that in doing so some of the charm will wear off or the surprises that you had on the first read won’t reappear. One series of books and indeed one book in particular, that I have returned to again and again over a good few decades is ‘Tales of the City’ by Armistead Maupin. As it is LGBT History Month this month I decided it was a fitting time to return to Barbary Lane once again, hopefully bringing a few of you along with me. At the end of her vacation from her homeland of Cleveland, Mary Ann Singleton decides, rather recklessly for her, that staying in the city of San Francisco should be a more permanent move. Initially moving in with her old friend Connie, who is a little more free and easy that Mary Ann can believe, she finds her own apartment at 28 Barbary Lane above her mysterious and initially rather odd seeming landlady Anna Madrigal, neighbours Mona, Mouse, Brian and soon Norman. It is Mary Ann’s story of arriving and settling in San Francisco that makes the initial tale in which more and more tales of the mixed bunch of characters around her diverge and merge off of, some linking back on each other and some adding twists and turns you wouldn’t see coming. All together they do, as the title suggests, make a wonderful collection of tales, and indeed a narrative of, the city. I don’t want to spoil the tales and their twists for you though so I won’t discuss the plot/s further. For me the main joy of the book and this has been the case every time, in the fifteen years that I have re-read it on and off, is the fact that it feels like real life. The city of San Francisco comes straight off the page, I haven’t been there (and would love to if anyone fancies treating me, ha) but I feel I have, so vivid is the description and the atmosphere of the place from the luxury of the Halcyon’s apartments to the supermarkets and dry cleaners of downtown. In fact it does very much feel like a love letter to and from San Francisco in many ways. ‘You should.’ Mrs Madrigal smiled. There was something careworn about her face, but she was really quite lovely, Mary Anne decided. ‘Do you have any objection to pets?’ asked the new tenant. It is the characters that steal the show, Mrs Madrigal, Mary Ann and Michael/Mouse in the main, walking off the page as they do so with flaws and all. Maupin is a master of characterisation and prose each character being multifaceted with good sides and bad, secrets here and there and just regular people of all walks of life. I don’t think in any book I have read outside of the ‘Tales of the City’ series have I found a set of characters that depict all aspects of society, in terms of ages, sexuality, backgrounds, wealth, races, etc, without feeling false of like the author is trying too hard. Maupin covers homophobia, terminal illness, affairs (of people of all ages and sexualities), spies, murder, lies and even cults without any effort or feeling like he is trying to make a shocking statement. There is also a short sharp episodic feel to the book, no surprise as originally it was serialised in a San Francisco paper, that makes it almost unputdownable; you find yourself saying ‘just one more, oh go on another one’ as you go along. For me at fifteen, and still at thirty if I am honest, what Maupin says to me is that these are characters who are all trying to figure themselves out and so you can too at the same time. As the series goes on, and the more you return to it, all these characters feel like friends. Here I have to admit I wanted to – okay I still do a bit – take the place of Mouse when I was fifteen and have best friends like Mary Ann Singleton and Mona and live in one of Mrs Madrigal’s apartments. In that teenage phase we all have, I think, where I used to save up 20p a week to runaway it was Barbary Lane that I was aiming for. I owe a huge thanks to Armistead Maupin for not only for making me love reading and providing me with escape in my younger years but for also making me realise it was okay to be a bit different from everyone else, that it didn’t matter – or that it wouldn’t matter to those people who really cared about me – and that I would find my way in life okay. It was books like this one and how it reached out to me, way back when in my teens, and made me want to start something like The Green Carnation Prize so other people could find books like this as well, be they a teenager or adult. Anyway, I have gone off on a tangent, as you can see ‘Tales of the City’ is a book that means a huge amount to me. It is a book, for me, which epitomises what reading is all about, exploring worlds we don’t know and with characters walk off the page and we befriend from all walks of life. It’s one that is a joy to discover for the first time, which I hope some of you have done or will do, and even more of a joy to return to time and time again – and it never seems to age. 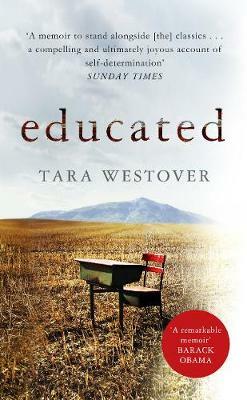 I cannot recommend, or love this book, enough. Who else is a fan of ‘Tales of the City’ and the series? Who also loved the TV show, why can’t they do the whole lot? Who has returned to it again and again? Who has tried it for the first time and what did you make of it? I now have one more mission for 2009 is to read all the ones that I haven’t read yet but own. Plus there are many more coming, I actually have a PDF proof version of Deborah’s next book, but I am not allowed to say anymore than that. Dovergreyreader looked at Mitfordmania when she reviewed A Pursuit of Laughter by Diana Mosley and it brought up some rather heated debate on Diana as a person. I don’t condone her like for Hitler I don’t even attempt to understand it, but what I was always taught in history was to look at both sides and someone who saw both sides of Hitler and one of the biggest events in our worlds history was Diana and though I don’t agree with her ideals I will be interested to hear her side of things if that makes sense. 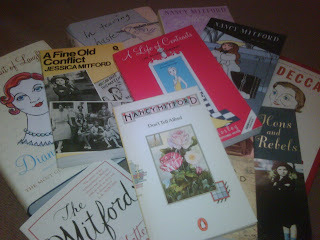 The other question that was raised was ‘are there too many Mitford based books on the market?’ I would say no, I actually think that some of their own books need to be reprinted rather than so many books about them in all honesty. I can understand the fascination though, they knew a wide range of famous people and indeed some of histories most renowned faces and through their love of letters and essays have captured years and year’s worth of history. I just wonder what Debo makes of it all as the furore around her and her sister is going and she is living to see it? 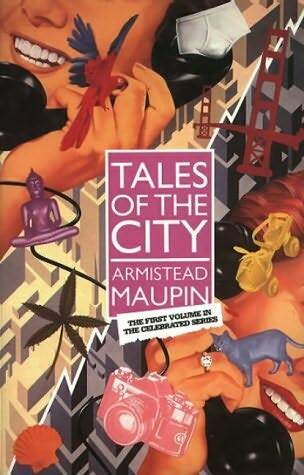 On a slightly different note another series of books I am going to make it my aim to read (well re-read in some cases) arrived yesterday also The Tales of the City Series by Armistead Maupin…. I first read the first three or four (or possibly five) of these about 8 years ago and wanted a land lady like Miss Madrigal, and strongly believed when I moved to London I would make some of the best friends in the world and they would be diverse and wonderful and everything would be fabulous. I would say half of that wish came true. I very rarely re-read novels I have read so it will be interesting to see what I make of these almost ten years down the line! I will keep you posted. I am currently debating if I should read all of them with no stop-gap, but am worried I will get Maupin Overkill, any advice?